Thanksgiving weekend will bring a major change in the organization of streetcar service on King Street, a further expansion of the new Express Network, and several service improvements mainly during the off-peak period. As I reported in a previous article, the 514 Cherry route will disappear as a distinct entity. Service on 504 King will be changed to a configuration to the design used over summer 2018 while Broadview Avenue was closed for construction. An eastern and western branch will serve the route overlapping in the central section. The 502 Downtowner route operates between Bingham Loop (at Victoria Park) and University Avenue weekdays until 7:00 pm. This remains as a bus service pending availability of enough streetcars to restore streetcar service to McCaul Loop. Peak period 503 Kingston Road Tripper streetcars operate from Bingham Loop to York & Wellington via King. Service to the Charlotte loop at Spadina, part of the summer design, was discontinued with the return to fall schedules in September. Scheduled headways on the outer parts of the route are wider than currently operated on the premise that the route will operate with larger Flexity cars rather than the old CLRVs. The TTC’s intent is to have the route completely converted to new cars by the end of the year. As of September 13, about three quarters of the AM peak 504 King cars were operating with Flexitys as well as all of the 514 Cherry cars. Based on Flexity delivery rates, the conversion will not complete before the new schedules go into effect and a few CLRVs will remain at least to late October. The TTC plans to use these only on peak period trippers so that off-peak service is fully provided by Flexitys. 952 Lawrence will operate from Lawrence Station to Pearson Airport via Dixon Road during peak periods. The combined local and express service will provide about 13.5 buses per hour compared to the current 12 at the express stops. Concurrent with this change, the end of construction at Lawrence West Station, service on the Westway branch will be cut back from Yonge Street to its usual eastern terminus at the Spadina subway. This branch will also change from 5 to 4 buses per hour during the AM peak. Overall, the total number of buses assigned to this route will rise slightly during peak periods, but weekday off-peak headways will widen slightly. 924 Victoria Park will operate during peak periods replacing the 24E Victoria Park Express. This is only a rebranding, and the number of AM peak buses is actually dropping by one in the new service design. 929 Dufferin will operate weekdays in peak and off-peak until mid-evening between Wilson Station and the Dufferin Loop at the western entrance to Exhibition Place. Concurrently, the peak period short turn at Tycos Drive will be dropped and all of the local 29 Dufferin buses will run through to Wilson Station. The peak period combined frequency at express stops will improve, but local stops will see less service. Both the local and express services will operate with articulated buses. 989 Weston will operate during peak periods as a through service from Keele Station to Steeles overlapping both the 89 Weston and 165 Weston Road North routes. There is no change on the 165 schedule. The combined service at express stops will improve over current 89 Weston levels. Service on Sheppard East will be reorganized on weekends. On Saturdays, the 85 Sheppard East local service will change from articulated buses to standard-sized vehicles, while the 985 express service to STC will change from standard to artic buses. On Sundays, the 985 Sheppard East Express will change to artic buses. Concurrent changes will lower the capacity provided on the 85 service while slightly increasing it on the 985 express. However, the headways (time between vehicles) on the express service will widen to offset the use of larger vehicles. Service on Finch West will be improved on weekends by provision of 939B Finch Express service to Finch West Station during the daytime. There is no change in the local bus schedules, and so this is a net new service, albeit not a very frequent one. Lawrence West Station will re-open as a bus terminal for 59 Maple Leaf and the Westway branch of 52 Lawrence. The 109 Ranee and 400 Lawrence Manor buses, which had been stopping on street, will move back into the bus loop. Concurrently, because of the large number of buses on Lawrence serving this station, the through services to Yonge Street will continue to use on street stops and riders will require transfers to enter Lawrence West Station unless they are Metropass or Presto users. Track construction at Lansdowne and Dundas will complete. The 47 Lansdowne, 402 Parkdale and 505 Dundas routes will resume their normal operation. Given the speed of recent construction projects, this is likely to occur before the official schedule change. City construction at Yonge and Sheppard is finally complete and the 97 Yonge bus will resume its normal route rather than being split at Lawrence. Various seasonal services will end including the trial operation of 175 Bluffer’s Park. Its future will be the subject of a report to the TTC Board in 2019. On current schedules, four trains in the AM peak originate at Finch Station rather than operating from Wilson Yard. This will be increased to five. At the end of the AM peak, trains running in to Davisville currently short turn northbound at Lawrence Station. This requires co-ordination with the southbound service and can cause delays and gaps. On the new schedules, these trains will run through to Finch northbound, and then dead head southbound to Davisville. Although this will remove a problem at Lawrence, it could worsen queuing problems northbound at Finch. In the evening, all trains running in to Wilson Yard will do so southbound from Vaughan using the new north entrance to the yard, rather than short turning northbound at Wilson. 11 Bayview will get better AM and PM peak service. 25 Don Mills will get better service on its 25C branch to from Sheppard to Steeles during weekday midday and PM peak periods. 925 Don Mills Express will see a slight improvement in AM peak service. 54 Lawrence East will receive better service on both branches on Saturday afternoons. 63 Ossington will receive better late evening service on Saturdays. 95 York Mills Saturday service will be revised both to operate more frequently, and to extend the hours of the 95B service to UTSC which now ends eastbound from Yonge just before 7 pm into the mid-evening. Saturday afternoon service on 102 Markham Road will improve slightly, but evening service north of Steeles Avenue will be cut from every 20′ to 30′ at York Region’s request. 112 West Mall will receive improved weekday midday service. Service on 129 McCowan North will be improved on Saturday daytimes primarily by trimming excess running time. 131 Nugget will get better service on Saturday afternoons. Details of all changes are in the PDF linked above. 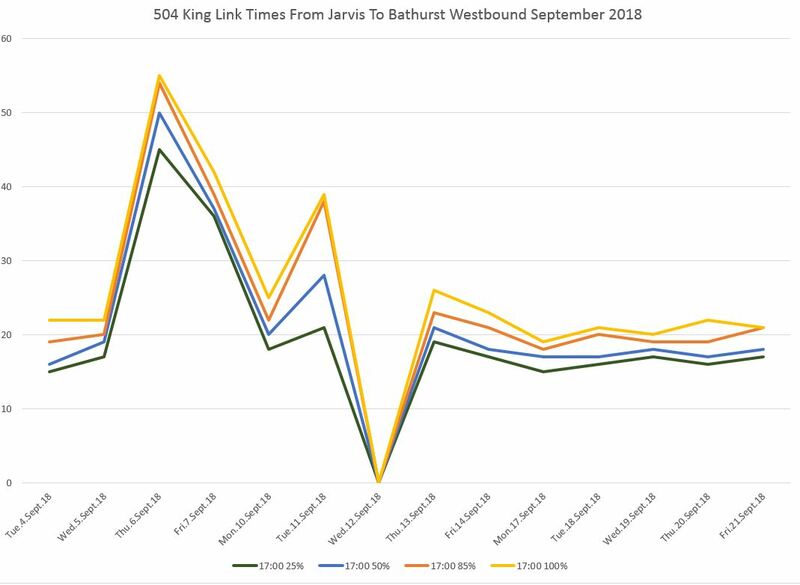 This article is an update from a previous item about service capacity, as well as a look at the travel times of Queen cars through downtown and the effect of the King Street Pilot. 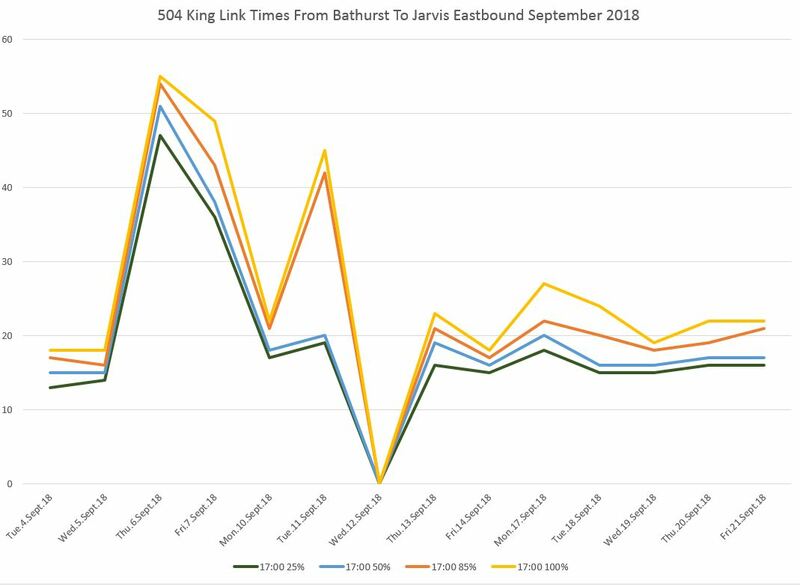 This article continues the series reviewing the operation of transit service on the King Street transit priority pilot. August brings two major events that affect service on King Street, although the traffic problems are concentrated at the western part of the line: the Caribbean Carnival and parade on Saturday, August 4th, and the CNE from mid-August onward, especially with the air show in the final days of the month. Both of these bring congestion through Parkdale notably at the approaches to The Queensway and to Jameson Avenue westbound. 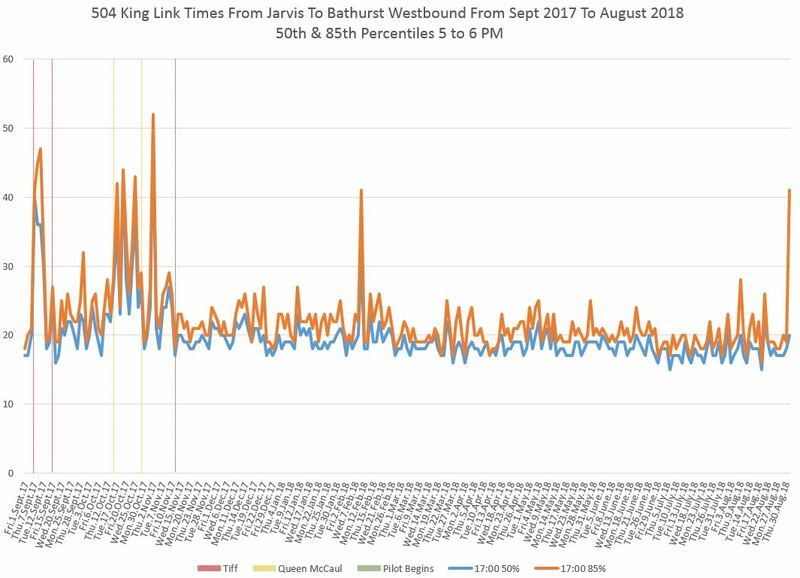 Wednesday, August 8: A delay near Church Street held a few cars causing a jump in the 85th percentile value although the change to the 50th (median) percentile was much lower. The cause of the delay is unknown because the TTC did not issue a service alert. 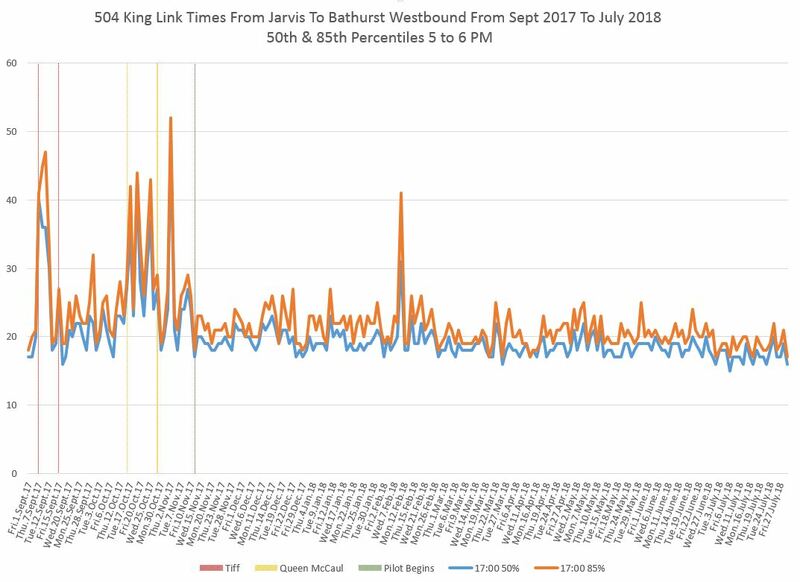 Tuesday, August 21: Severe congestion westbound to Spadina from about 5:40 pm onward drove up both the 85th and 50th percentile values. Again, there was no TTC alert indicating a problem. Friday, August 31: “Police activity”, as the alert put it, required diversion of streetcars in both directions due to an incident west of Yonge Street. The spike in the 85th percentile was caused by one car that crossed Jarvis at about 5:30 pm but was not diverted. As a result its trip, including the delay, was included in the 5-6pm data for the pilot district. As with the August 8 data, note that the change in the 50th percentile is small and on a par with typical day-to-day variations. For comparison, here is the eastbound chart. 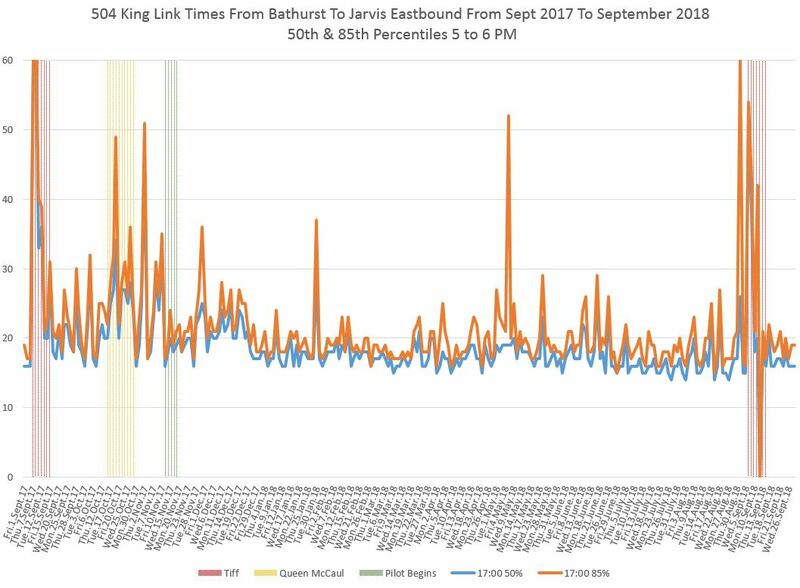 This article is part of a continuing series tracking the behaviour of transit service on King Street during the pilot implementation of pedestrian and transit priority measures. The last update was in May, and I skipped June because there was little new to report. 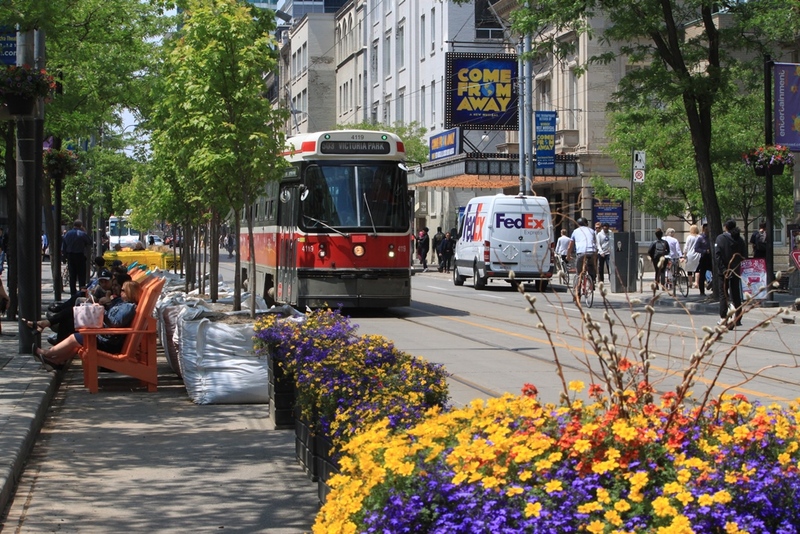 Although we are now into the summer when conflicts with pedestrians and space constraints from recent takeovers of curb lanes with a variety of artworks and seating areas, travel times on King have not been affected. In fact, thanks to the re-activation of Transit Priority Signalling (TSP) at various locations on July 7, travel times have actually dropped during some periods. 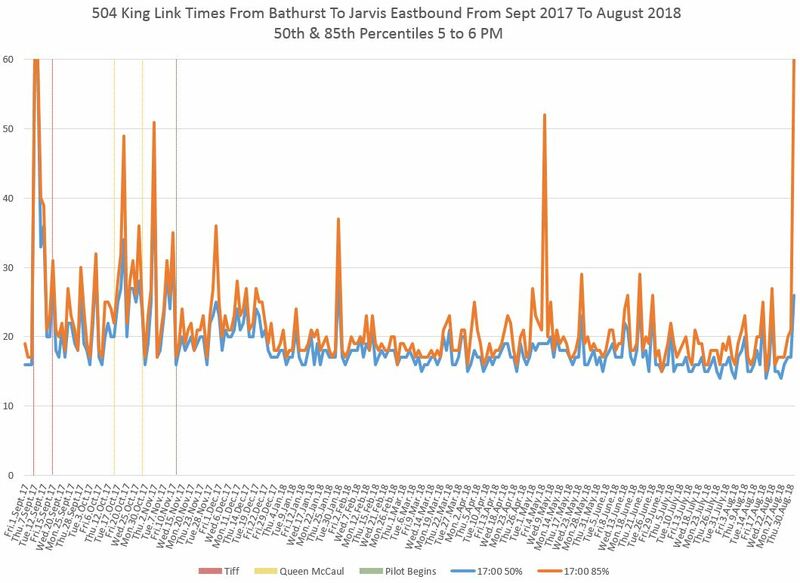 Continuing the tradition of these articles, here is the travel time chart for the 50th (median) and 85th percentile values westbound from Jarvis to Bathurst from September 2017 to the end of July 2018. June 26 eastbound: Service held at Church Street just before 2pm (and therefore counting in the 1-2pm travel time stats) by a fallen overhead wire. June 26 westbound: Service held at Peter Street at about 10:40 pm by a collision. July 10 westbound: Service held east of Bathurst Street at about 1:15 pm by a collision. July 25 westbound: Service held near Church Street just before 9 am. Reason unknown (no TTC eAlert was issued). Correction August 15, 2018: Off peak service for the Westway branch of 52 Lawrence has been corrected. In Part I of this article, I reviewed the evolution of bus and streetcar fleet capacity measured by scheduled service over the period from 2006 to 2018. The central point was that there has been little improvement in the overall peak period capacity operated on the bus network for much of the past decade. On the streetcar network, two recent changes – the addition of buses to supplement streetcars and the replacement of old cars by new, larger ones – have provided some peak period capacity growth. However, in both cases, this growth is small seen over the long run. Off-peak service has improved more because the system is not fleet-constrained outside of the rush hours, but there is still a budgetary limitation which affects how much staff are available to operate these vehicles. In this article, I will review several major suburban bus routes to compare service in January 2009 when the benefits of the Miller-era Ridership Growth Strategy had kicked in with service operated in January 2018. Given the results seen in Part I, it was no surprise that when I compiled this information, many routes have less capacity today than they did a decade ago and improvements where they do exist are not major. That is not a recipe for system growth. How did this happen? First off, when Rob Ford became Mayor, he rolled back the RGS Service Standards and service just stopped improving. Several off-peak improvements were undone, but these affected periods outside of the range reviewed in Part I (mainly evenings and weekends). Ironically, the streetcar system suffered less because, thanks to the vehicle shortage (even a decade ago), the loading standards for streetcars in the peak period had not changed. There were few RGS improvements to unwind. When John Tory reinstated some of the RGS standards, this allowed growth to resume, but almost entirely in the off-peak period because neither the bus nor the streetcar fleets had spare vehicles. Another more subtle problem lies in TTC scheduling. As congestion built up on routes, the reaction was to stretch existing headways (the space between vehicles) rather than adding more buses to a route. This responded to the vehicle crunch, but it gradually trimmed service levels across the system. 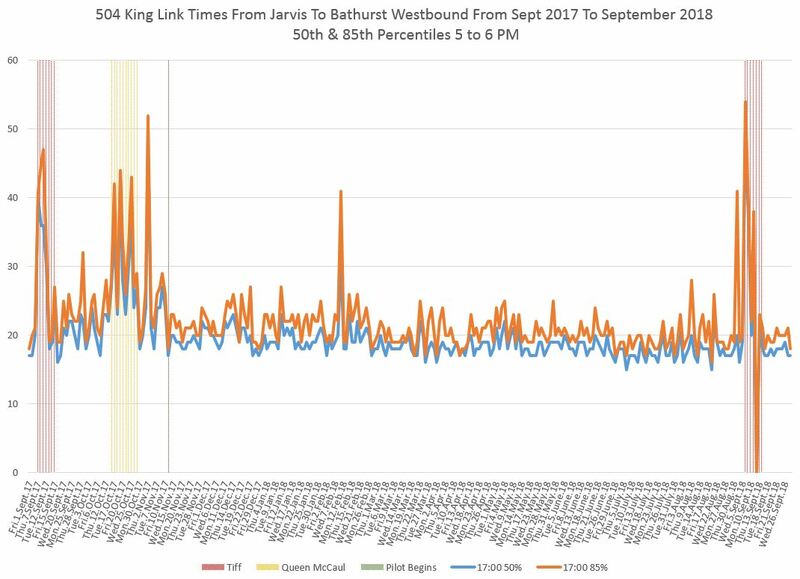 Even though the same number of buses were in service, with fewer passing a point per hour the capacity of service riders saw declined. The TTC made excuses for this practice as simply running buses to the conditions, but the long term effect was to cut service to keep operational demands within the available fleet size. The balance of this post summarizes the data for each route. The full set of tables is linked below as a PDF. Services are grouped by corridor because, in some cases, more than one route operates along a street. For example, Lawrence Avenue West has been served by 52 Lawrence, 59 Maple Leaf and 58 Malton (now folded into the 52). Service capacity is shown as buses/hour. The only adjustment for vehicle size is that articulated buses count as 1.5 so that 6 artics per hour is the same, from a capacity point of view, as 9 regular-sized buses. Where a headway is followed by the letter “A” in the tables, this means that artics are operated. In some cases, routes have a branch where every “nth” vehicle takes a longer trip. For example, some of the services running through to York Region have every 3rd, 4th or 5th bus going beyond the “standard” destination. These do not provide net additional service where the branches rejoin in the same way as a branching route where half of the buses go one way and half the other. In other words, if a 5 minute service runs to Steeles and every 4th bus runs beyond on a 20 minute headway, the headway to Steeles is still only 5 minutes, or 12 buses per hour. These cases are noted with an asterisk “*” in the tables. Some routes were affected by the opening of the Vaughan extension. In these cases, data are shown for November 2017, the last set of schedules before the routes changed, so that the evolution of service right up to that point is clear.